You just can't miss "Swampy" the World's Largest Alligator, measuring in at 200 foot long, keeping guard at the entrance to Jungle Adventures Nature Park & Zoo! 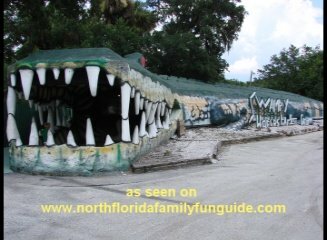 Located on State Road 50 just 8 miles west of I-95, this popular natural wildlife attraction has been around since 1968! Your kids will love this park! There are 4 events to experience here. There is the Nature Walk, where you can get up close with Turtles,White-Tailed Deer, Skunks, Monkeys, Lemurs, Florida Panthers, Black Bear, Gray Wolves, Tropical Birds, and much more! Then there is a 4-part guided tour which includes an interpretive lesson at the Indian Village, an up close alligator feeding adventure, a swampy boat ride aboard the Jungle Swamp Queen, touring the Green Gator River, and a hands-on interpretive wildlife show with snakes, alligators, and more! Bryan loved to feed the turtles, monkeys, and even feed the baby alligators a hot dog on a fishing pole! So much fun! We love to learn all about Florida animals, and this place is a great place to do it. This was Bryan's first time holding a REAL baby alligator! Thank you Jungle Todd, our wonderful, funny, Jungle Adventure Guide! We had a great time and learned a lot! For more adventures, they even offer an after hours Dinner Adventure in the Jungle, which includes steak and pasta, then a moonlit Jungle Swamp Cruise, and a Wildlife Encounters Show! They have something spooky coming up for Halloween, and we will let you know as soon as it is announced!! Jungle Adventures Nature Park & Zoo - Buy Tickets!